Summary: Alma DeGeer Dunahew, the mother of three young boys, works as the maid for a prominent citizen and his family in West Table, Missouri. Her husband is mostly absent, and, in 1929, her scandalous, beloved younger sister is one of the 42 killed in an explosion at the local dance hall. Who is to blame? Mobsters from St. Louis? The embittered local gypsies? The preacher who railed against the loose morals of the waltzing couples? Or could it have been a colossal accident? 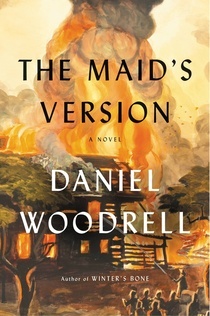 When I saw the review for THE MAID'S VERSION by Daniel Woodrell in Entertainment Weekly a few months ago, I immediately added it to my must-read list. The magazine (which is my go-to source for book reviews) raved about it -- giving the book an A. And there aren't a whole lot of books out there getting A grades from EW. THE MAID'S VERSION is about a tragic explosion at a dance hall in West Table, Missouri in 1929. Exactly what happened was a mystery and there were many possible suspects. The main story is told through the eyes of Alma, a woman who worked as a maid at the time of the explosion. Her sister ended up being one of the 42 who were killed, and Alma thinks she knows what happened. Her determination to get justice has ultimately affected her entire life... and especially her relationships with other. What actually happened at the explosion is eventually revealed in this short, but powerful, story. While the maid's story to her grandson is the primary one, there are also tales about many of the town's citizens including ones who were victims of the explosion as well as ones who were potential suspects. Let me begin my thoughts by saying that THE MAID'S VERSION is really a special story. The writing is nothing short of brilliant and I absolutely understand why so many fuss over Mr. Woodrell's writing skills. What I also found so amazing about this story is that it is only 164 pages -- technically a novella. I am in awe of how much the author packed into such a short story while also developing so many characters so well! And it is more than just the character development that impressed me. Quite simply, Mr. Woodrell is a beautiful writer. His prose is so eloquent that I found myself going back and re-reading some of the descriptions just because they took my breath away. I know I sound like I'm gushing, but his writing is just so eloquent and rich! I have to agree with Entertainment Weekly's review that said, "Maid's is a whodunit, but really it's the who and not the dun that stays with you." While I'd normally talk about the mystery behind the explosion, it almost took a backseat to the character development in this story. (Notice, I didn't use this book as part of my Mystery Mondays feature.) Mr. Woodrell created dozens of characters and each one is memorable in his or her own way. These characters made an impression on me, whether it be good or bad; and their interactions with each other were fascinating. I wasn't able to find a reading guide for THE MAID'S VERSION but that shouldn't stop you from considering this novel for your next book club. It is a quick read because it's so short, but it also has more to discuss than many full-length novels. Some of the themes you might want to explore include love, family, secrets, and justice. THE MAID'S VERSION is a little book that packs a powerful punch. Highly recommended! I've read a short story collection by Woodrell and I thought it was very well written but on the dark side. It sounds like he's written another winner with this one. YES, this sounds amazing! Definitely adding to my TBR!! I'm kinda shocked that you could get so much drama and characterization in that short number of pages! I did notice this one in EW. I'll have to look into it! Started it today -- probably the most descriptive 1st page I have ever read!! At first I wasn't drawn to this one, but the synopsis pulled me in, especially since it takes place in MO. I'll have to take a look at this one!